NoSQL databases have been around for several years now and have become the preferred choice of data management for a variety of business use cases. With the emergence of other trends like distributed systems, cloud computing, social media, mobile devices, and Internet of Things (IoT), the need for NoSQL database solutions has only become more critical in the recent years. 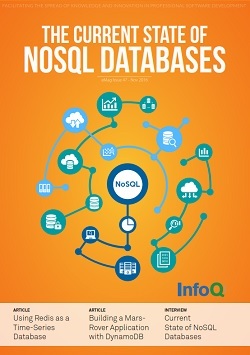 NoSQL databases offer a lot of advantages compared to the traditional relational databases, in terms of linear scalability, better performance and cost effectiveness for managing the data. They provide features like data partitioning and replication out-of-the box which are critical for running applications in distributed system environments. NoSQL databases also offer built-in integration with big data technologies like Hadoop and Spark. It's important to take a look at the current state of NoSQL databases and learn about what's happening now in the NoSQL space and what's coming up in the future for these database technologies. Highly Distributed Computations Without Synchronization - Synchronization of data across systems is expensive and impractical when running systems at scale. Traditional approaches for performing computations or information dissemination are not viable. In this article Basho Sr. Software Engineer Chris Meiklejohn explores the basic building blocks for crafting deterministic applications that guarantee convergence of data without synchronization. Using Redis as a Time-Series Database - In this article, Dr. Josiah Carlson, author of the book “Redis in Action”, explains how to use Redis and sorted sets with hashes for time series analysis. Building a Mars-Rover Application with DynamoDB - DynamoDB is a NoSQL database service that aims to be easily managed, so you don’t have to worry about administrative burdens such as operating and scaling. This article shows how to use Amazon DynamoDB to create a Mars Rover application. You can use the same concepts described in this post to build your own web application. Key Lessons from Transition to NoSQL at a Gambling Website - In this article, author Dan Macklin discusses the transition to Riak NoSQL and Erlang based architecture coupled with Convergent Replicated Data Types (CRDTs) and lessons learned with the transition. Virtual Panel: Current State of NoSQL Databases - NoSQL databases have been around for several years now and have become a choice of data storage for managing semi-structured and unstructured data. These databases offer lot of advantages in terms of linear scalability and better performance for both data writes and reads. InfoQ spoke with four panelists to get different perspectives on the current state of NoSQL databases.